Not-so-grand exit for two of Pontiacs finest, 1973-1974 Grand Prixs. Foley, Alabama's Brian B. stumbled upon these soon-to-be recycled Pontiac Grand Prixs at Pull-A-Part in Montomery. Looking more demolition derby, rather than the mix of luxury and performance that was a staple of the Grand Prix line-up. 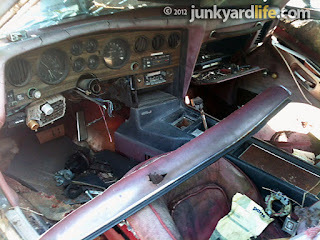 Restyled 1973 GPs rolled off the assembly line with stylish sheetmetal, an angled cockpit appointed with real African crossfire mahogany and the largest engine Pontiac ever produced. The ability to withstand nearly four decades as a battering ram was never a selling point. It no doubt would have boosted the impressive total of 153,899 Grand Prixs built in 1973. Of those 133,150 were standard Model Js with the 400 four-barrel. 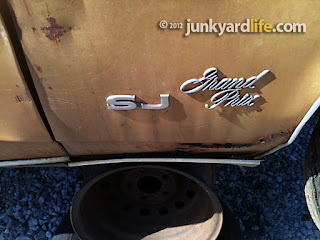 Only 9,812 savvy buyers opted for the rare SJ model. Let's dig deeper. The '73 Grand Prixs decreased their wheelbase to 112-inches from 116-inches but gained 3 inches in overall length to 216.6-inches. Try parallel parking one of these beast downtown. No wonder the body panels were beat to heck. Did I just crush a hybrid? 1973 Pontiac SJ "455 cu. in." 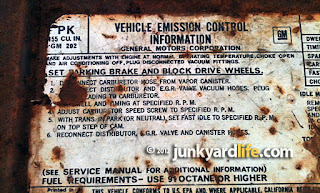 engine, see top left corner of emission decal. 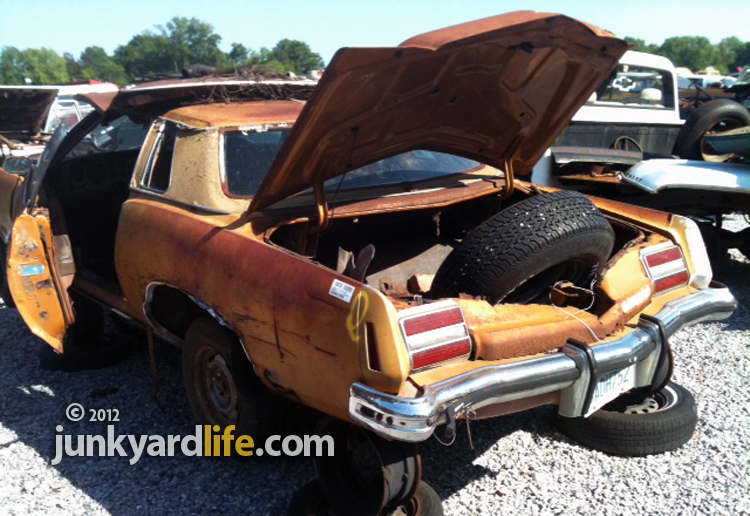 Junkyard 1973 Pontiac Grand Prix. Note the distinctive '73 tail lights. 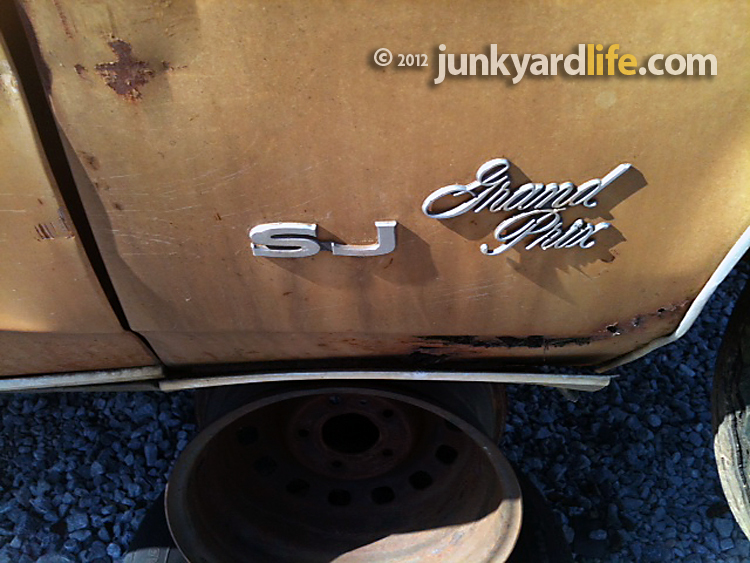 Grab your tools and run if you see Grand Prix parts you need. These two Grand Prixs are still on the yard in Montgomery as I write this. 1973-1977 models are difficult to find. Many of these colonnade-style GM models have already been scrapped over the years because of the 4,400-pound curb weight on some loaded examples. 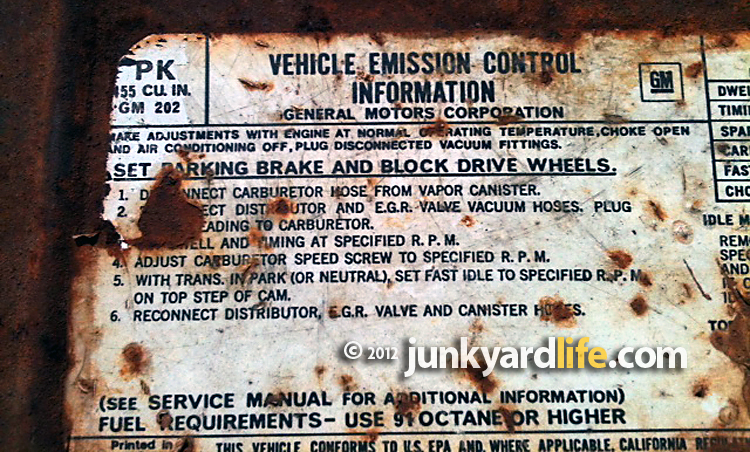 High gas prices will continue to send many more of these to the car crusher. That's a double edge sword for Grand Prix fans. These cars and parts will be more expensive in years to come. 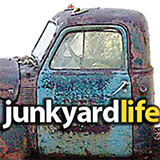 Good news if you have a GP in decent shape, bad news if you want to buy or restore one. Junkyard 1974 Pontiac Grand Prix Model J. One-of-99,817 total GPs built in '74. 1974 Grand Prixs had simulated woodgrain decals on the dash. Wraparound cockpit is too cool. 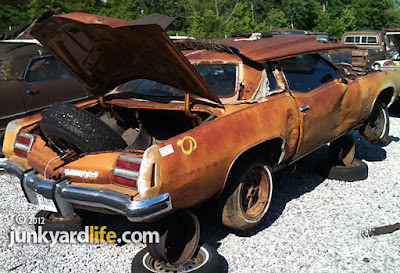 I miss my 73' Grand Prix...it was my first fixer upper and i was young(clueless bout fixing cars). Wish I still had it, I would be working on it all the time. Now that I know a lot more about cars(fixing them). Guess you have to learn the hard way.